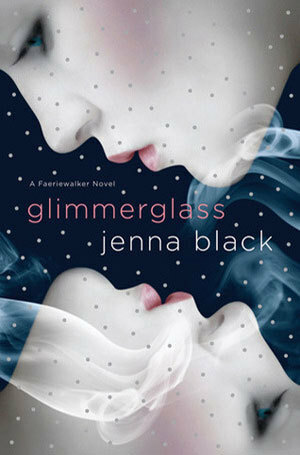 Glimmerglass by Jenna Black is the first book in her Faeriewalker series. Dana Hathaway doesn't know it yet, by she's in big trouble. When her alcoholic mom shows up at her voice recital drunk, again, Dana decides she's had enough and runs away to find her mysterious father in Avalon: the only place on Earth where the regular, everyday world and the captivating, magical world of Faerie intersect. But from the moment Dana sets foot in Avalon, everything goes wrong, for it turns out she's isn't just an ordinary teenage girl, she's a Faeriewalker, a rare individual who can travel between both worlds, and the only person who can bring magic into the human world and technology into Faerie. Dana finds herself tangled up in a cutthroat game of Fae politics. Someone's trying to kill her, and everyone seems to want something from her, from her new-found friends and family to Ethan, the hot Fae guy Dana figures she'll never have a chance with... until she does. Caught between two worlds, Dana isn't sure where she'll ever fit in and who can be trusted, not to mention if her world will ever be normal again. 1. I really liked this world Black created in Avalon where the human and Fae worlds collide. Black does go a bit against convention in that her Fae are able to outright lie. I loved the intrigue that Black adds with Fae politics both with the political power struggle in Avalon, and the parties wanting Dana dead. 2. Dana is an interesting dichotomy of human and fae, plus the struggle of being the responsible adult for years, and yet still longing to be the child. At times Black illustrates the struggle she has between being the one to take of everyone, and now having someone take care of her. I loved seeing her open up to Kimber, and I hope to have more interactions between them in series. 3. Kimber and Ethan are an interesting sibling pair. The tension that has built between them because of Ethan's gifts with magic is palpable at times. I really liked Kimber once her personality showed through the tension, and she appears to be a good friend to Dana. Ethan is the sibling I am less sure of his goals with Dana. He does seem to genuinely like her, but I question if that is enough to keep him from using her for his plans. 4. There were some great developments and discovers made by Dana and her powers in this book, and it will be interesting to see how Black grows them in future books.